The first edition of PICTURE THIS_ took place on March 30, 2017 in Copenhagen. 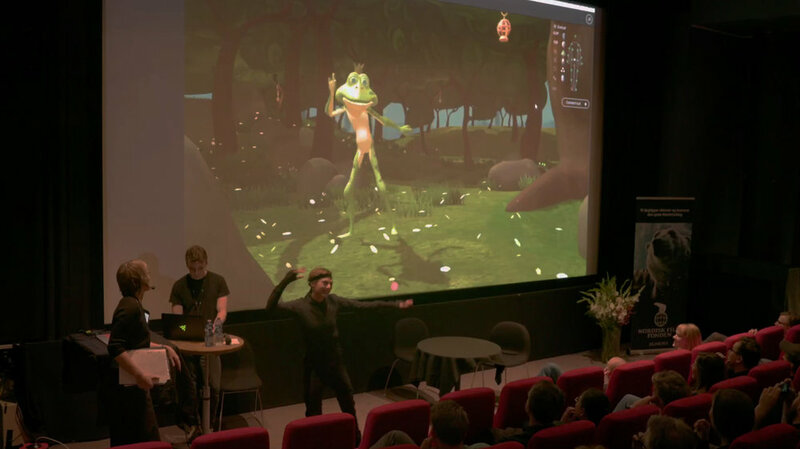 More than 200 film practitioners and students were joined by Danish and international filmmakers, experts and developers to explore and discuss the technology that shapes how we develop, produce and experience the motion pictures of tomorrow. The conference was moderated by Kate Bulkley, award-winning journalist and media commentator (The Guardian, Broadcast Magazine, London, UK). Following the welcoming speech by Ulrik Bülow, Member of the Board of Trustees, Egmont (Nordisk Film Foundation), and introduction by Prami Larsen, Head of Filmworkshop/Copenhagen, production and narrative designer, Alex McDowell took the stage with his opening keynote. Alex McDowell works at the intersection of design, technology and storytelling and has 30 years of experience as a production designer for feature films, working with directors David Fincher, Steven Spielberg, Tim Burton and Terry Gilliam, among others. In his keynote McDowell called for a radical reimagining of our inceptive, prototyping, and development processes. He described a world building practice that reimagines the creation and development of traditional and post-cinematic storytelling, across media, to create an infrastructure for Twenty-First Century Production. Using his experiences as a production designer on Steven Spielberg's sci-fi drama MINORITY REPORT, McDowell described the revelation in flipping the production process, so that the art department started designing the world a year before the script was written. Instead of following a script, his team created a ‘future reality’ based on a couple of basic facts: that the city of Washington in year 2054 is a non-dystopian place with ‘pre-cogs’ who can predict when murders are about to happen. The team gathered real information from laboratories, corporations, architects, and urban planning to envision worlds that don’t yet exist. The research informed the script, and the result was a near-future world, which has proven to accurately predict several aspects of future technological advances. Since the release of MINORITY REPORT more than 100 patents have been filed for new technologies based on the film’s imagined ones, such as the gesture control used by Tom Cruise to locate crimes before they happen and the self-driving cars. "It wasn't that we were being so clever, we did deep research," said McDowell. According to McDowell, we are now at the edge of “a massive disruptive revolution”, the greatest disruption of storytelling in history, largely caused by virtual reality and interactive media, that gives us the capability of designing in a spherical narrative world space. “We can now look at the world as a space from which stories can emerge, and we have to think differently about the way we collaborate around that space. The technology, we have in our hands now, is so accessible and so important, because it begins to tap directly into the way we think. I think, we are close to an intuitive connection to our media,” said McDowell. He suggested a dismissal of the traditional, Victorian tools of creations and outmoded linear processes in favour of a more holistic process with an open mind towards intuitive, collaborative development and production processes that allows us to enhance our storytelling, in traditional cinema as well as new media. “My mission with world building is to start building a new language for design which allows different people from different media spaces to start collaboration early in the process. It brings all the decision-making much further forward and enables us to make film more efficiently – and in the end, get more of our story on the screen,” he said. As founder and creative director of Experimental Design and as Director of the USC World Building Media Lab and World Building Institute, McDowell, his team and interdisciplinary students are using the methodology of world building to design immersive story worlds that unfold across multiple media platforms. His practice applies the power of fiction to the real world, helping clients imagine the future and help solve real world problems, from climate change to refugee crises. Sophie Bech, Head of Experiences at Rokoko, a small Danish startup based in Copenhagen and San Francisco, kicked off a series of presentations introducing new tech tools and case studies of creative collaboration. With the Smartsuit Pro Rokoko has created an “entire motion capture studio in one suit”. The technology behind the Smartsuit Pro is made out of 19 sensors similar to the ones in smartphones, all embedded in the suit. On the lower back sits a small hub with just enough room for a Wi-Fi module, a processor and a battery pack making the suit wireless and portable. The recorded movement data is sent to a computer, where you have the option to run Rokoko’s free software or another 3D software such as Unity. Sophie Bech donned the suit and demonstrated, how it makes it easy to visualize and interact with your storyboard in real-time. With a click of a button every move she made in the suit was echoed by an animated green frog on the big screen behind her with the accuracy of her own shadow. The big studios have been using optical systems for doing motion capture, but the SmartSuit represents a totally new and very intuitive affordable way of working. According to Sophie Bech it represents a shift for the world of motion capture technology. “Now there is a more affordable alternative making its way into the hands of people besides the big studios,” said Bech. In the case study of MAN DIVIDED director Max Kestner and VFX Supervisor Martin Madsen took a deep dive into the development of their science-fiction drama and shared, how their collaboration early in the process had affected key aesthetic and budgetary choices. "The premise of the movie is that 50 years in the future the world is ravaged by ecological disaster, the oceans have risen and all natural freshwater is gone. So, we had this entire city, we needed to build with water flooding through the streets of Copenhagen. This is of course doable on a high-level American budget, but we needed to figure out, how to create this world on a Danish film budget," said Madsen. VFX came in very early on and tied into the writing and the storytelling. “We tried to envision this world long before shooting to clarify, how it would actually work. And to be able to tell the story, we had to set up some rules and make big decisions from the outset not to have had to make a million small ones later on,“ said Kestner. The team knew that they would need exterior transportations scenes, showing a working infrastructure with piers controlling the water levels, docking stations and boats. With detailed breakdowns of CG-heavy scenes from the film, Martin Madsen showed the audience how going digital is not always the best way to do things. "It’s often a blend and a mix. Water is something that is extremely expensive and hard to create in CG, so you want to get as much of that in the camera as possible and create as little as you need in CG." On many occasions, they actually went 'old school'. For instance, they build a real miniature set of a flooded street leaving the amount of digital work needed in post much lesser than if it had been built in full CG, and offering the cinematographer the possibility of shooting multiple angles, since the build was there. In other scenes, they used a backdrop of projections instead of green screens. Besides saving them a lot of money, it gave them unanticipated flexibility and was a gift for the director and actors, who on-set could see exactly, what the audience was going to see instead of having to act against a green screen. “You need to look at the advantages that every technology offers, analyse every shot, prioritise effects and make sure that you are applying the best approach to get the most out of the money you have,” concluded Madsen. MAN DIVIDED (Danish title QEDA) is set to premiere in Danish Cinemas later this year - watch the newly released trailer. Allan O. Lückow, CEO and founder of MoCopenhagen, then took the stage to engage in a practical discussion of issues related to on-set previsualization and the concept of virtual production. On-set previs is the actual showing of mixed media on the film set e.g. live from camera, CGI or pre-recorded backgrounds/foregrounds, storyboard, animation etc. The term ‘virtual production’ used to be limited to real-time digital production, but is today understood to mean the entire workflow of a modern film production incorporating visual effects. Virtual production includes all of the steps that take place from pre-production to the final delivery of the movie. Lückow took the audience behind the scenes of different on-set previsualization and virtual production attempts, starting with a very early example of IMMORTALS (2011) and the first Danish attempt, DR FEELGOOD (2012), talking about what was learned and how the technology has since evolved. However, the concept of virtual production is still a little known concept and a less applied production method in the Danish film industry. According to Lückow it’s a method that is making enormous strides and can generate amazing results for feature films as well as TV series – it’s a general misconception that it only applies to big budget film productions. It is about the state-of-the art and the future of filmmaking applying not only to Hollywood blockbusters, but also to independent films and TV series. Allan Lückow made the case that it is not only a tool for saving production cost, it is a creative tool that opens up for making films with multiple locations (even on a budget) and allows for the actors, director, cinematographer, etc. to actually be able to see what’s going on (the final result), while filming up against e.g. a green screen. In the afternoon, the world’s most pervasive game engine designer, Unity Technologies, joined the line-up of speakers to discuss, how games technology is taking storytelling in new and exciting directions. Representing the company were producer Silvia Rasheva and director Veselin Efremov from Unity’s demo team, to specifically go through their process of creating the real-time rendered short film ADAM from inside a Unity game engine. Discovering that many filmmakers used the engine, the purpose of producing the film was to test the limits of Unity's technology and visual quality, which is constantly evolving. The power and flexibility of the software with real-time rendering is impressive allowing the film’s director to change the camera angles on some scenes and create an entirely new opening scene within hours from shipping the film. The agile production process and the ability to iterate all the way up to the end of the process, is characteristic of the games industry, and maybe soon for film and TV. Although you still need to know how to code to use the software that underlies ADAM, we did hear a promise that a version for non-coders is imminent. The Unity game engine was also applied in the creation of award-winning VR experience NOTES ON BLINDNESS : INTO DARKNESS – winner of the 2016 Tribeca Storyscapes, Kaleidoscope VR, and the Prix Europa, among others. In 1983, after decades of steady deterioration, John Hull became totally blind. To help him make sense of the upheaval in his life, he began documenting his experiences on audio cassette. John's original recordings, the sensory and emotional universe of his voice, form the basis of this immersive, interactive experience, which uses gameplay mechanics, real time 3D, virtual reality, and binaural sound to explore the interior world of blindness. In this case study Amaury La Burthe, CEO of AudioGaming and co-creative director of the project, shed light on the iterative process behind the production. What began as an idea for a podcast based on found sound material to accompany an existing short film evolved to become a ground-breaking VR experience that is not only technically astonishing, but also remarkably moving. The key to VR storytelling, La Burthe said, is to make it so immersive that the viewer forgets the conflicting experience between the body and the mind. With NOTES ON BLINDNESS : INTO DARKNESS, he focused on an immersive audio experience paired with a visual composition of space, giving a sense of the depth of the world. With the support from the newly inaugurated SMILE – Samsung Media Innovation Lab the attendees also got the opportunity to personally experience “Notes on Blindness: Into Darkness” throughout the day as a part of PICTURE EXPO running alongside the conference programme. Two sessions at PICTURE THIS_17 was devoted to the discussion of cinematography and image technology. First up was German cinematographer, Rolf Coulanges, who discussed the aesthetic quality of the digital image. Since its inception, he said, digital cinematography has been developed by and with a strong focus on technology, which at best shows a preferred realistic illustration. All its technical developments were intended to eliminate any artefacts that would disturb a realistic representation of an image. From a technical point of view this makes totally sense, and is perhaps even the only comprehensible approach to develop a new technology. But Coulanges raised the question, if the 'perfect' image, is what we as artist want to achieve? Drawing on some of the greatest paintings in the history of art, from Vermeer to Rembrandt and Hopper, as well as sequences from iconic feature films, such as L'ANNÉE DERNIÈRE À MARIENBAD (1961) and MEMENTO (2000), Coulanges put the technology in perspective by reminding us that ”technology is great, but may not in itself be serving the artistic vision – the perfect image may not be what we want”. The discussion of image technology continued with senior image artist at Arri, Jan Fröhlich, who shared his research on High Dynamic Range (HDR). HDR is a big topic in distribution with both Amazon and Netflix using it as distribution format, but HDR is way more than just another deliverable, the technology has aesthetic implications and should be seen as a tool for storytelling. While the technology rarely benefits the home viewing experience, it has great potential on the big screen, although many cinematographers are reluctant to embrace it. According to Fröhlich, creatives should also focus on the development of HDR, and not just leave it up to technologists. One challenge with HDR is that motions appear stuttering. Fröhlich noted that HDR can only be used to full potential when combined with HFR (Higher Frame Rate) technology, and called for more experimentation with HFR. In his closing keynote, strategist analyst and co-founder of SampoMedia, Peter Buckingham discussed innovation of the cinema experience and the challenges for European arthouse cinema in terms of reaching an audience. While Hollywood films are offering extensive experiences with 3D, HDR, immersive sound, premium large formats and event cinema, 'regular' arthouse film have difficulties matching up, when it comes to drawing audiences to the cinema, especially the young generation. Resigning to a small screen release is not satisfactory, if the film is made for the cinema. The medium is the message, and cinema is a different experience, which provides heightened expectations, argued Buckingham. In his view, European filmmakers should take up the battle and not leave creative innovation to mainstream Hollywood. A big thank you to the speakers and participants, who joined us for PICTURE THIS_17. Our gratitude also goes to our supporters and collaborators from Creative Europe MEDIA Desk Denmark, Copenhagen Film Fund, The Royal Danish Academy of Fine Arts Schools of Architecture, Design and Conservation – KADK, The National Academy of Digital Interactive Entertainment – DADIU, Danish Association of Cinematographers – DFF and SMILE – Samsung Media Innovation Lab. PICTURE THIS_17 was initiated and funded by the NORDISK FILM FOUNDATION and organized by FILMWORKSHOP/COPENHAGEN.